For a teenage girl from the slums neighboring the Nairobi district of Komarock, attending secondary school is a tall feat. She often confronts poverty, broken families, abuse, and social stigma to gain access to an education. St. Thaddeus School, a longtime partner of Global Peace Foundation, contributes by providing affordable education, but the most important factor to a student’s success is her personal determination and social support. 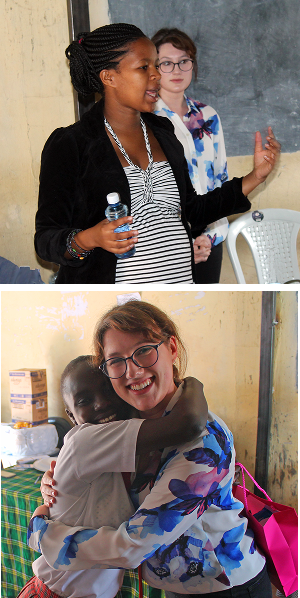 To strengthen positive relationships and build on the innate strengths of students, Global Peace Women (GPW) Kenya, launched a mentoring program at St. Thaddeus in early May. Throughout the year, students will connect with women role models and follow a curriculum to cultivate character skills and values that will help them navigate through adolescence and young adulthood. GPW Kenya representative Misco Mungai and Christina Bleu from GPW International hosted the first session on May 21, helping the girls explore life goals, discuss their value as women, and identify the unique contribution each of them wants to make in their families, schools, and community. The yearlong mentorship program will educate the girls on various topics ranging from women’s leadership, core values, personal hygiene, and stress management. In addition, students and mentors will design and implement local service projects. Global Peace Women is the women’s division of the Global Peace Foundation and seeks to uplift the value of women through advocacy, networking and service. St. Thaddeus School is supported by St. Thaddeus Child Care Society, which rescues girls who are orphaned or have been victims of early marriages or gender based violence, and assists them to get an education.